And don't forget to check out our Premium Feeds, Elite Specialties and Suet Products! 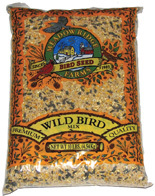 Meadow Ridge Farms Wild Bird Mix is a great economical way to feed a wide variety of birds. It offers a great opening price, and a friendly price for beginning bird enthusiasts. This mix has a high percentage of millet, which often encourages people to return for more complex seed mixes, such as the Premium Wild Bird or Deluxe Cardinal mixes. • Sizes: 40lb, 20lb, 10lb. Striped Sunflower Seeds are a popular feed for larger songbirds. They are bigger than Black Oil Sunflower and harder to crack open, so birds such as Cardinals, Jays and Woodpeckers can enjoy them with less competition. Many bird lovers will use this to mix in with other blends or as a straight feed. • Sizes: 50 lb, 25lb, 10lb, 5lb. Meadow Ridge Farms Sunflower Hearts #2 are a great no grow option at a more economical price than the Sunflower Hearts Medium or Fine. The seeds are shelled or partly shelled to assure less sprouting and mess. This feed provides the same nutritional value as other Black Oil Sunflower seed. Meadow Ridge Farms Critter Crunch is a trail mix for wild birds and other backyard wildlife. This fruit and nut blend provides premium nutrition for all. This is a popular mix for customers who like more than just birds. The 8lb bags are the best sellers. 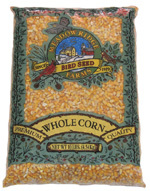 Whole Corn is a popular feed for deer, squirrels, birds and other wildlife. Corn contains many valuable nutrients including protein and fiber. Providing whole corn may help to divert bigger birds like blue jays from eating out of other feeders. • Sizes: 50 lb, 25lb, 10lb. 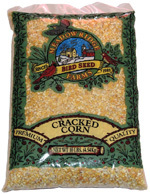 Cracked Corn is a popular feed for deer, squirrels, birds and other wildlife. Some customers will also mix this in with their own blends. While it contains smaller pieces of corn than whole corn, it supplies the same necessary nutrition and is easier for some smaller birds to eat. 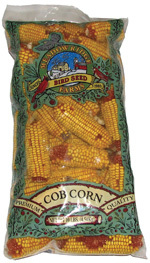 Cob Corn is a great and entertaining way to feed squirrels and wild birds. Feeding this way makes squirrels work for their food. Put a string through the cob and hang from a tree or shepherds hook to get a great view. These are best sold when paired with squirrel feeders in displays. • Sizes: 25lb, 10lb, 5lb. 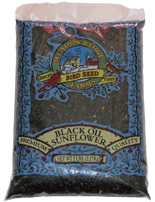 Black Oil Sunflower Seeds are the #1 choice for feeding wild birds. These are often purchased to create unique blends or as straight feed. Black Oil Sunflower is definitely one of the most versatile bird feeds. We suggest placing larger bags at very competitive price points. The smaller bags are convenience items that will allow for higher margins. • Sizes: 50lb, 40lb, 25lb, 10lb, 5lb.